Young Sherlock Holmes is a new take on the classic tales of Sherlock Holmes by Sir Arthur Conan Doyle, in which we see the famous Sherlock Holmes first meet his trusty companion Watson at boarding school where they work together to solve a series of puzzling murders plaguing London. Directed by Barry Levinson (Rain Man, Toys) and written by Chris Columbus (Gremlins, The Goonies), the film stars Nicolas Rowe (Da Vinci’s Demons), Alan Cox (The Dictator), Sophie Ward (Jane Eyre) and Anthony Higgins (Raiders of the Lost Ark). The film included the first fully computer-animated character and was nominated for Best Effects, Visual Effects at the Oscars. The historic Barons Hall in Penshurst Place served as the Brompton School gym for the scenes where Holmes (Nicholas Rowe) fences with Professor Rathe (Anthony Higgins). Penshurst Place is a 14th century building known for its historical significance and architectural beauty. Its medieval design has made it a popular location for a number of film and television shows including The Other Boleyn Girl (2008), Merlin (2008) and The Princess Bride (1987). 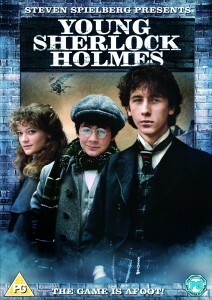 Young Sherlock Holmes was released in cinemas in 1985 and is now available to buy on DVD. This entry was posted in Filmed in Kent and tagged feature film, Penshurst Place, Young Sherlock Holmes film locations. Bookmark the permalink.